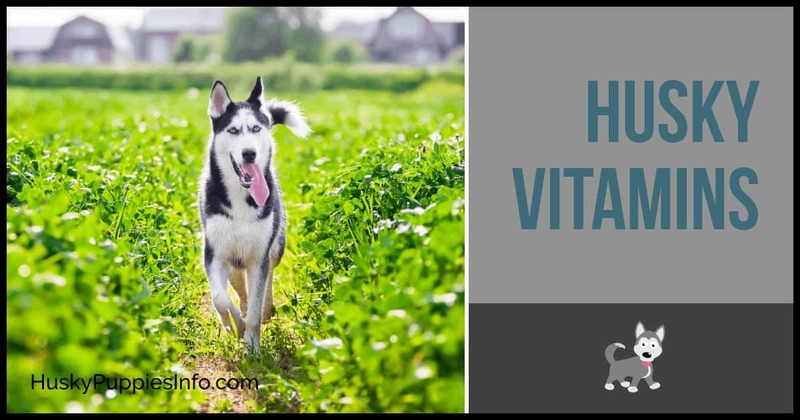 Are you thinking of buying vitamins for your Siberian Husky? Wondering what the best vitamins or best food is for dogs? Here is our advice on what to feed your puppy to give it a balanced diet, and avoid unnecessary and expensive supplements. Think of it as a cheap pet insurance. You probably already know this expression from childhood: you are what you eat. If you eat healthy food, you will feel good and healthy. The same applies to your pets. If you feed them good quality pet food they will feel better and have less medical complaints. Spending a little more on a better quality food for your Husky could save you hundreds, if not thousands of dollars in vet bills over the life time of the dog. This is especially true for Siberian Husky puppies which need the best food you can afford, to give the dog the best chance at growing in to a health adult. What makes a good dog food? If you see the words “Complete and Balanced” on the label then that is a good start. The FDA imposes strict rules over the “Complete and Balanced” phrase. Only quality pet food can quote that wording on its packaging. Furthermore, look closely at what is going in to the food. Is it real meat with a high protein percentage? Is there other nutritional information such as the presence of vitamins, Omega3 fish oil, or other additives that would benefit the dog? Then that is also a good sign. Generally speaking the more expensive the pet food the better quality it will be, because quality pet food costs more to produce. It has more meat and less filler. However this is not always the case. Sometimes expensive pet food isn’t any better than the cheap ones. You might want to ask around your local dog clubs, breeders, vets, and even your neighbours to see what they recommend and where to buy it from. Do dogs need vitamin supplements? Tens of millions of dollars are spent each year on pet supplements in the US alone. There are a number of vitamin companies marketing vitamin products; NuVet, ProSense, Nutrivet and many others. Their job is to convince you that your beloved pet needs their product to be happy. They also have affiliate programs and advertise on many Siberian Husky web sites to make it look like they are recommended for Huskies. The reality is for the vast majority of Huskies do not need vitamin supplements. If you are feeding your dog quality pet food, with some variety or rotation in the meals, then you are doing great! There will of course be exceptions. If you feel that your Husky is experiencing problems such as difficulty moving, appetite problems, or is easily exhausted, then a trip to your vet is warranted. The problem might be diet related, or it could be something else entirely. Your vet is going to give you knowledgeable advice and help pinpoint the issue. The problem with guessing and trying out supplements is that the imbalance that your pet might have could be made worse by choosing the wrong supplement. Just like in humans there are some vitamins that are good in small doses, but in larger doses can actually make you feel worse! Feeding your dog the wrong supplement could be doing more harm than good. So take care. Also don’t forget we have some advice on food to avoid feeding dogs. There are some foods the disagree with dogs and you want to ensure they are eliminated from your pet’s diet immediately. Which are the best vitamins for dogs? So having convinced you not to supplement your dog’s diet, there are a couple of things that are generally considered safe to feed to your pet. You could at least try and see if they make a difference. Glucosamine is a supplement well known to help humans with joint pain such as arthritis, and many Siberian Husky owners swear by its effectiveness on animals. You might already know that Siberian Huskies are predisposed to health complaints such as hip dysplasia, and glucosamine can aid in the discomfort your dog might exhibit. Have a read of this article on Pet Education to find out more about how Glucosamine might help alleviate discomfort in older dogs with joint pain. Omega3 (fish oil) can help with coat and skin complaints, as well as joint pain. Omega3 is sometimes added to pet food so check out the packaging and you might be able to avoid extra supplements altogether. If your Husky has dry or flakey skin, or you just want to improve the health of his or her coat, then fish oil could be beneficial. For more information on Omega3 and dogs check out this article on Dogs Naturally. There is one particular situation in which a multivitamin for dogs might be of benefit. If you are cooking the dog meals yourself and not using a prepared dog food from the supermarket or pet store, then there is a chance that some required vitamins and minerals are missing. This would particularly be true if you tend to use the same meat and not introduce variety such as vegetables or added vitamins. In this particular circumstance then a multivitamin could help “fill in the gaps” with the nutritional profile. Then again, if you are cooking meals for your dog the chances are you are doing so because you know what is going in to the food and, with purpose, introducing variety not present in commercial foods that you can obtain or afford. Your vet should be your primary source of advice for health issues with your pets. They have the up-to-date knowledge and experience needed to diagnose problems accurately. Since you should be taking your Husky to the vet regularly for a checkup, these appointments are the perfect opportunity to ask the question about whether vitamin supplements are suitable. If the answer is yes, you should narrow down precisely which vitamins the dog requires, and in what quantity. The Siberian Husky Club of Victoria has produced some information on feeding your Husky which could also be of interest. We recommend you do not feed your Husky multivitamins or vitamin supplements without consulting your vet first. At best you might get lucky and your dog benefits from them. If you are feeding your Siberian Husky quality pet food then there is little more that a supplement can do. At worst you could be causing an imbalance in your dog’s dietary intake and might cause some harm, even of only mildly. So if you think you have a problem, take notice of what’s on the label of your pet food, and perhaps try a different brand or nutritional make-up and see if things improve. A simple tweak to the diet might be all that is needed to improve your Husky’s health!